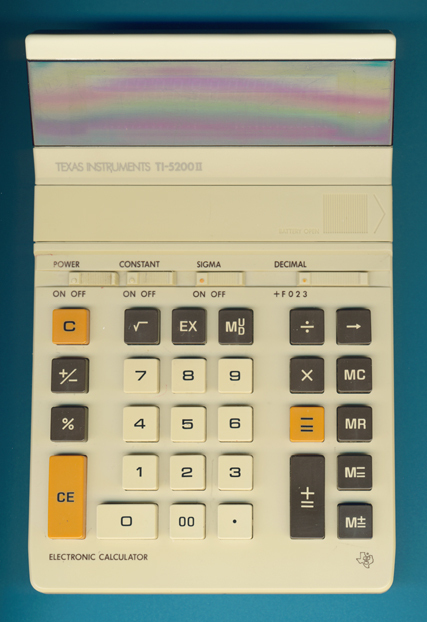 Size: 7.5" x 5.1" x 1.65"
Texas Instruments introduced already in January 1977 with the TI-5200 a well designed desktop calculator with 12-digits calculating capabilities. It took more than 6 years before its successor TI-5200 II hit the market - and another few months before the TI-5022 completed the family. Don't miss the TI-5100 II and TI-5020 sporting 10-digit displays in the same package.Please note the perfect access to the batteries between the keyboard switches and the display. Dismantling the TI-5200 II reveals a surprise: The printed circuit board (PCB) tells the manufacturer of this desktop calculator: Toshiba, Japan.